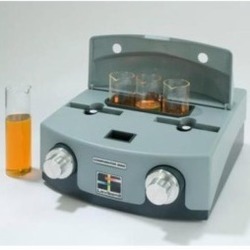 The Petroleum Oils Comparator (AF650) is a 3-field instrument for visually determining the ASTM Oils Comparator colour of samples by direct comparison with coloured glass standards. It incorporates the 16 glass standards which make up the scale in a pair of discs. Display: 16X2 line alphanumeric LCD. - Modes: Absorbance / Concentration. - Methods Abs/End Point/Fixed time at room temperature. - 20 Pre Programmed Test Parameters with Test Names. The Gardner Comparator 3000 is a 3-field instrument for visually determining the Gardner Colour of samples by Comparator 3000, direct comparison with coloured glass standards. We have emerged as a leading manufacturer and supplier of superior quality Colorimetric Analyzer. This instrument is used for measuring the chemical oxygen demand (COD) by thermal combustion. The offered instrument is manufactured by our experienced professionals using quality tested components with the help of cutting-edge technology. - Range: 0 to 5 mg/L range, dual, fully-adjustable set-point alarms. - Uses the only EPA approved method for continuous chlorine monitoring. - Colorimetric DPD chemistry - fast, reliable, economical. the auto color is a fully automated, extremely robust and portable spectrophotometer designed for the color analysis and dye concentration determination of fuels. Colorimetric and chemiluminescent elisa kits.